Certified professional auctioneer Kenny Lindsay is a nationally recognized and multiple award winning auctioneer who was also awarded with the Michigan Auction of the Year honors. 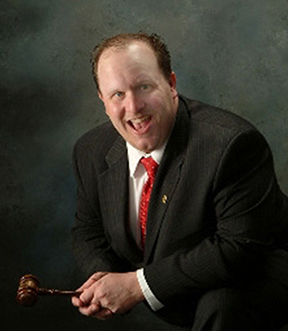 Lindsay is a highly skilled and accomplished auctioneer who finished at the top of his class at the Continental School of Auctioneering in Mankato, Minnesota. Several years later, he was accepted to and ultimately graduated from The Certified Auctioneers Institute (CAI) at Indiana University in Bloomington, Indiana. The CAI status is the most esteemed and highest possible designation in the auction industry which is equivalent to a PhD in the auction profession. Only approximately 1,100 auctioneers world-wide have achieved this pinnacle designation. In 2007, Lindsay achieved another significant educational accomplishment in Cincinnati, Ohio as a certified Benefit Auction Specialist. Only a few auctioneers in the entire state of Michigan are professionally recognized as a specialist in the $14.5 billion dollar nationwide benefit auction industry. Lindsay is a full-time professional consultant, educator and auctioneer for numerous non-profit organizations. He is a national columnist for several auction industry publications and has served on the National Auctioneers Association President’s Advisory Council. Lindsay is recognized by the state of Michigan as a Subject Matter Expert for being a key contributor developing the Michigan Auctioneers registration examinations. CAI is the Certified Auctioneers Institute which is the most esteemed and highest designation possible in the auction industry. The CAI status is equivalent to a PhD in the profession. Approximately 1,100 auctioneers worldwide have achieved this status. Founded in 1949, the National Auctioneers Association (NAA) is the world's largest professional association dedicated to professional auctioneers. The association is dedicated to providing its members with educational programming and resources to help them advance as professional auctioneers. Michigan Auctioneers Association is an association formed in 1951 by a group of aspiring auctioneers to represent the interests of auctioneers in the state of Michigan and has grown to be one of the pillars of the community of state auctioneers associations. The MAA has proven in the past to be one of the leaders in the industry, and is proving to continue in that direction in the future. In 2014, Kenny Lindsay was elected to President of this highly esteemed organization. The National Auctioneers Association created the Benefit Auction Specialist (BAS) professional designation to provide auctioneers with advanced training in planning and conducting successful benefit auctions, as well as techniques to establish a successful and profitable benefit auction business. The Professional Ringmen’s Institute is the only training institute in the nation totally dedicated to training and preparing individuals to serve the auction industry professionally and effectively as ringmen or bid assistants for their auction teams for any type of auction with any auctioneer. Lindsay was selected to the 2006-2014 MSAA Michigan’s Best All-Star Auction. He was also featured on the front page of the Detroit News and Free Press Newspapers on a benefit auction feature story along with other mentions and/or stories on WJR, WCAR, USA Today, Chicago Tribune, ESPN, Grosse Ile Camera, Monroe Evening News, Observer & Eccentric Newspapers, eBay Magazine, Bay City Times, Madonna Magazine, The Auction Exchange & Collectors News, Sports Collectors Digest, Orlando Sentinel, Tampa Tribune and other national trade publications. In addition, Lindsay is the founder of one of the most respected and long-standing sports memorabilia firms in the country. He is a former show promoter and nationwide exhibitor with a niche specialty of autograph authentications and vintage sports memorabilia. Lindsay has conducted private and public autograph appearances with multiple athletes, which include but not limited to: Detroit Red Wings’ Hockey Hall of Fame great, Gordie Howe; Ted Lindsay; Sid Abel; Maurice Richard; Steve Yzerman; Sergei Fedorov along with several Major League Baseball greats. Lindsay is still active in obtaining a wide selection of personally hand-signed items of sports memorabilia and is considered by many to be the inside source for many unique and premium items for live and silent auctions. 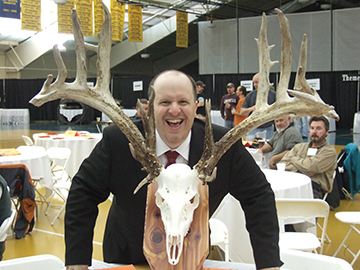 In 2014, Kenny Lindsay was elected by his peers to President of the Michigan Auctioneers Association. Lindsay is in good standing with the Michigan Auctioneers Association, Livingston Conservation & Sports Association, National Rifle Association, Michigan Big Game Hunters Association (Lifetime) and the National Auctioneers Association. Two State Champions Put Their Heads Together.